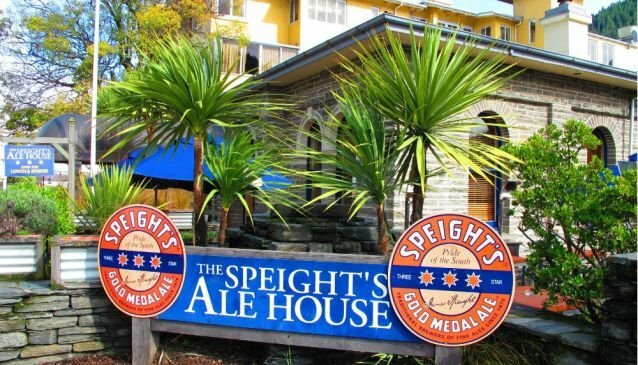 Located in the building of a former Queenstown Council Chamber that was built in 1880, Speights Ale House offers customers good hearty food with a selection of local beers. The extensive lunch and dinner menus offer a wide selection of good quality pub fare. Lamb Shanks, sausage and mash, Southern Ribeye, beer battered fish and chips, beef burger all feature along with arrange of side dishes that can double up as bar snacks. A children's menu is also available. The interior is warm and rustic with wood flooring and stone walls along with an outdoor seating area that's an ideal retreat during those warmer days in the sunshine. The pub includes two big screen TV's to catch the latest sports action. The pub is centrally situated on the corners of Stanley and Ballarat Street, close to the Village Green.